I spent some quality time last night chatting it up with @AdrianRodriguez about design, web, code, life… and we eventually touched upon a subject which is near and dear to my heart: kaizen. I don’t think I mentioned that explicitly in our conversation but I certainly expounded on it (sorry for the soapbox bro!). Kaizen means most simply continuous improvement. I think it should be (is) the mantra of our Christian walks as we continue to strive in faith, marked by the transformative power of Christ as we become more like Him. We must continually strive to improve upon the skills that we’ve been given and do all that we can to be the most effective vessels for His Glory. This can look different for so many people (and that’s partly the beauty of a diverse body of believers) and that’s a good and great thing. I am compelled to continually advance my knowledge of software development, practicum, theory, strategy, so that I might be the most effective for the Kingdom, using the gifts that God has so graciously given me. I’m not the best, nor the brightest, but that doesn’t really matter, now does it? 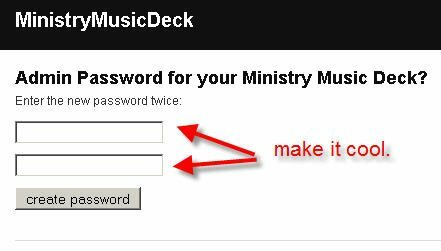 So, all that to say, I’m somewhat proud to release Ministry Music Deck, an open source platform based on open tape’s architecture and php. Yes, it’s free. Yes, do whatever you want to the code (make it even better…?). 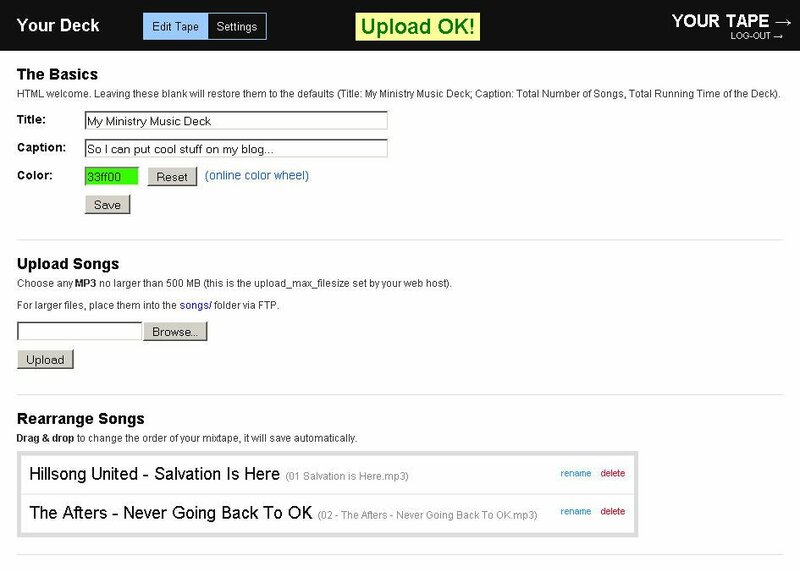 I’ve streamlined the code, gotten rid of unnecessary functions, and I’m positioning it for use by ministries and independent bands who want to get the word (and their music) out into the blogosphere. 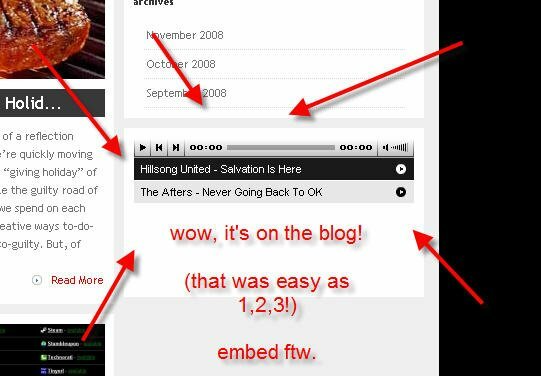 Ministries that want to upload sermons, podcasts, or mp3’s of content and distribute it. Independent bands who want embeddable players of their music. People who want to share their own private recordings on their blog. And much, much more (be creative and then come back and tell me). You could put up your personal CD collection but this would be ILLEGAL and the RIAA will kill (sue) you. DO NOT DO THIS. And that just makes your look lame. Take a look at a couple of the screenshots and I think it’ll be quite obvious how this all works. Take it for a spin, and then download the .zip yourself, install it, and then come back and tell me what you’ve done with it. Make sure to come back and tell me where you’ve installed it so I can include it on this on-going list of sites and blogs that are using it! of course! sourceforge.net is awesome… i troll it all the time. Very impressive work. Great addition to the Open Source community. I wonder if you can add any of your code hacks at Snipplr, which is a great repository of open source code. Just for open disclosure I did some outsourcing work for the folks who created Snipplr, but irrespective I think its a great tool. Again, fantastic work. Very nice. Real quick, am I uploading the contents of the extracted folder, or the folder with the contents in it? thanks for the full disclosure…! let me check that out.